SilentMode with a filthy mind right now, but I’m not going to clarify. I know I have been writing quite a few Friends set reviews as of late, but in all honesty it’s the only theme I’ve been particularly excited about this year and for quite a while. That and the Collectible Minifigures, but that theme is covered by someone far more popular and far more comprehensively. 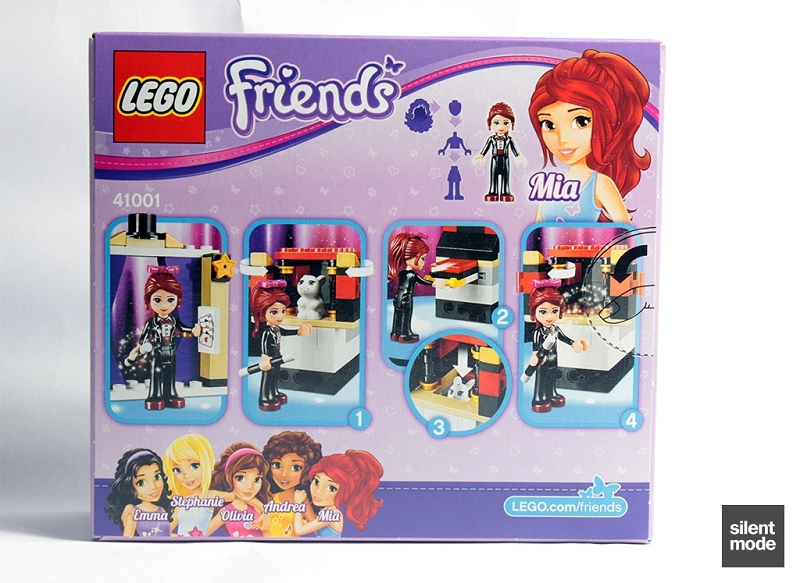 Anyhow, in this episode we will be taking a look at Mia in her GBP 9.99 set for early 2013. It’s been a while since we’ve seen Mia in these parts, and her last two outings weren’t fantastic – but let’s see what’s in store this time around. 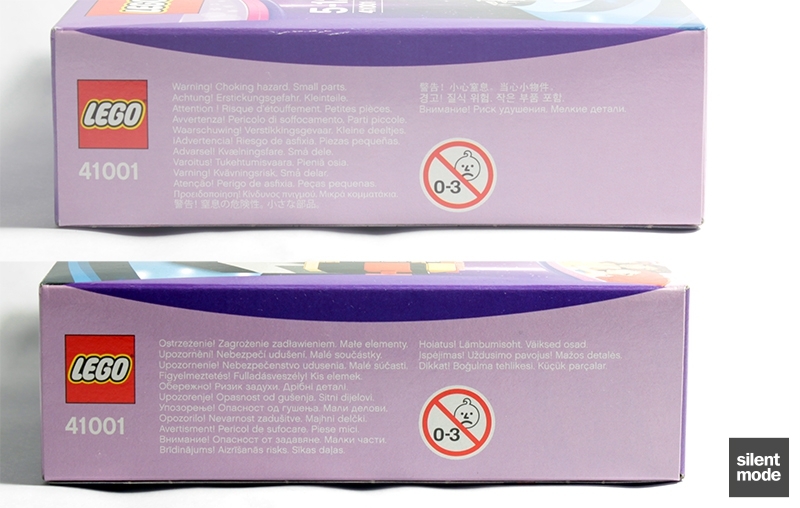 Of the four sets at this price, this one uses the most purple in the box design. As mentioned before, the designs for the four sets are remarkably different but compliment each other on the store shelves, making it difficult to choose just one. If the idea of a rather masculine-looking Mia floats your boat, this might be your set. 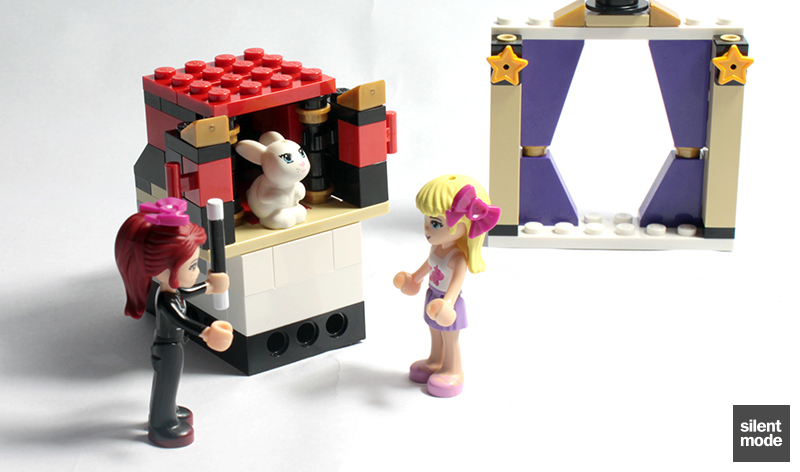 As usual the back of the box demonstrates the major play feature of the set: making the bunny disappear. Another chance to see the newly drawn Friends cast huddle up is on the bottom left. 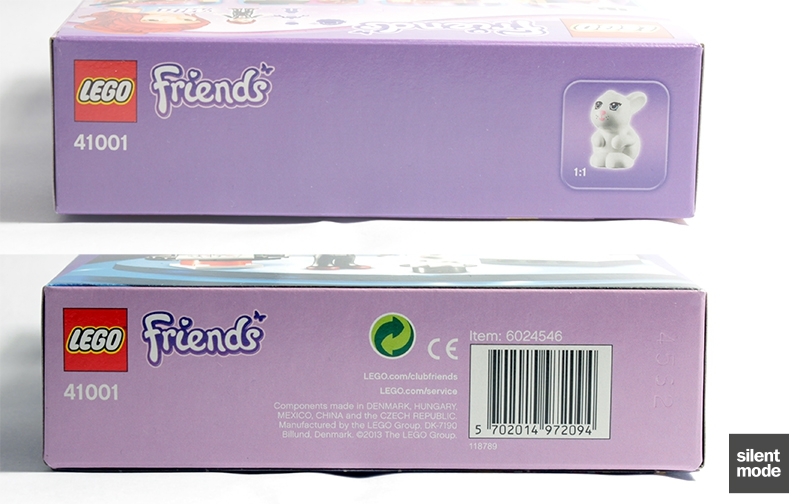 The bunny is used as a scale reference, but otherwise there is still nothing special on the sides of the box. 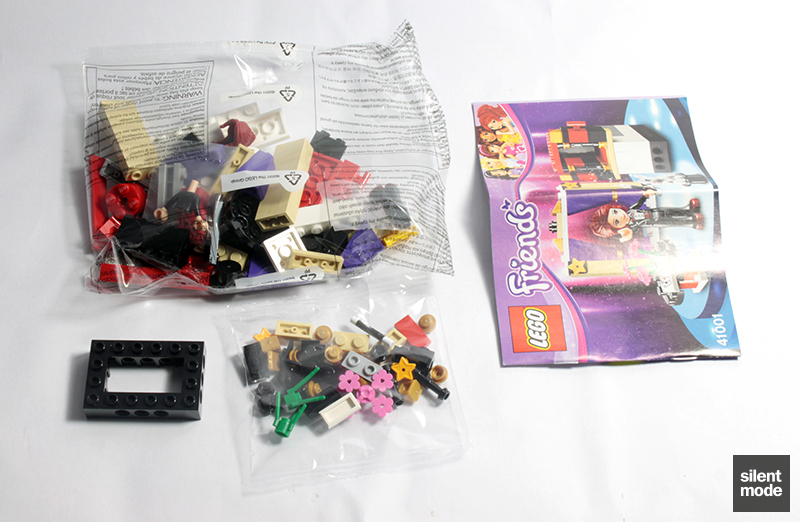 Cracking open this box of tricks ^_^ we have a slightly different combination: one large bag, a smaller bag, a 4×6 Technic brick and the folded instructions. 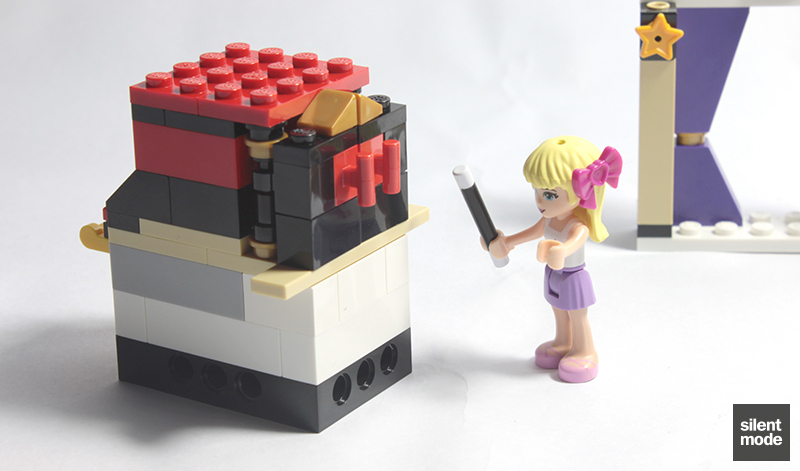 It’s not obvious from the box art that there would be a 4×6 Technic brick, until you re-examine the base of the cabinet. 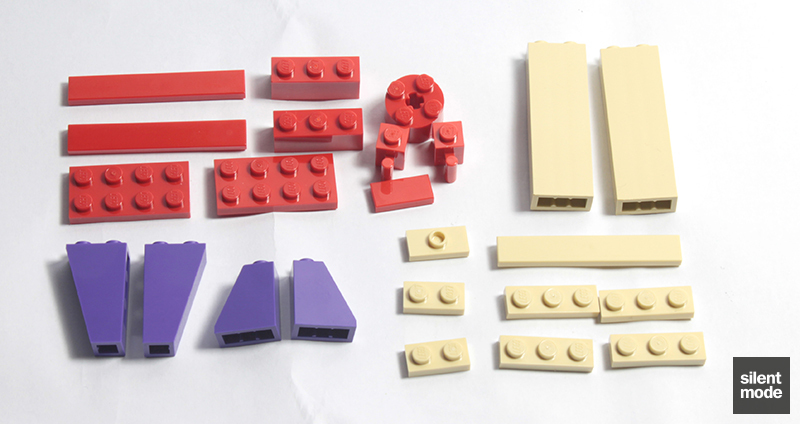 Along with the Technic brick there is a small selection of parts in these colours. Surprisingly we get three minifigure neck brackets in this set, which are great for attaching things to minifigures as body wear. 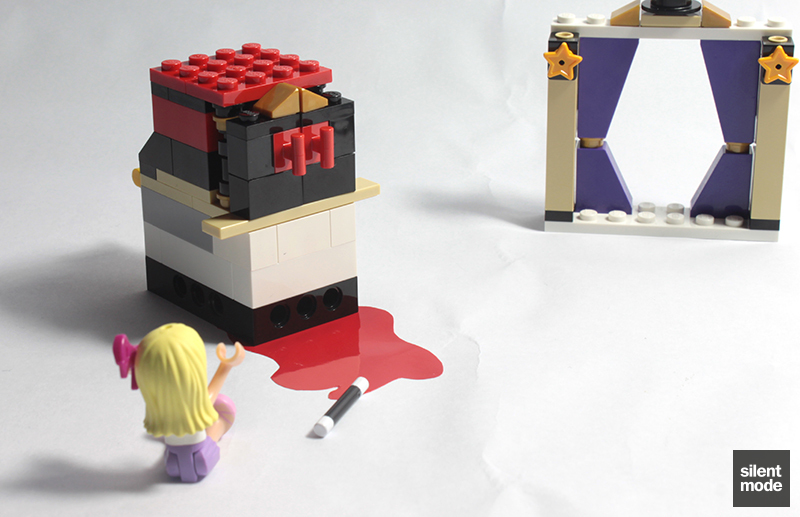 As with Andrea’s Stage, the other colours used in the set are primarily red and purple. For me, the only thing that really stands out are the 1x2x5 bricks in Tan – but it’s not necessarily the parts we get, it’s how they’re used. It should be noted that the Dark Purple slopes are only in this set and Rehearsal Stage at the moment, as they both introduce those pieces in that colour. The small parts are usually the ones to watch out for. There are a few Pearl Gold pieces if you like that sort of thing, and two (actually three) bows in Magenta – but you’ve probably got your eye on the printed tile. This tile is currently exclusive to this set, but don’t be surprised if you see it appearing later on in the year, perhaps in the upcoming The Lone Ranger theme. If you’ve missed it from the Series 1 Collectible Minifigures, it’s also another chance to get hold of a magic wand. These go for ridiculous prices on BrickLink, probably because they can charge them. Finally, take a look at those star pieces in Bright Light Orange: those are pieces that can sit on studs, much like the flower plates and 1×1 round tiles. Again these appear in both this set and Rehearsal Stage, and are currently only available in this colour. 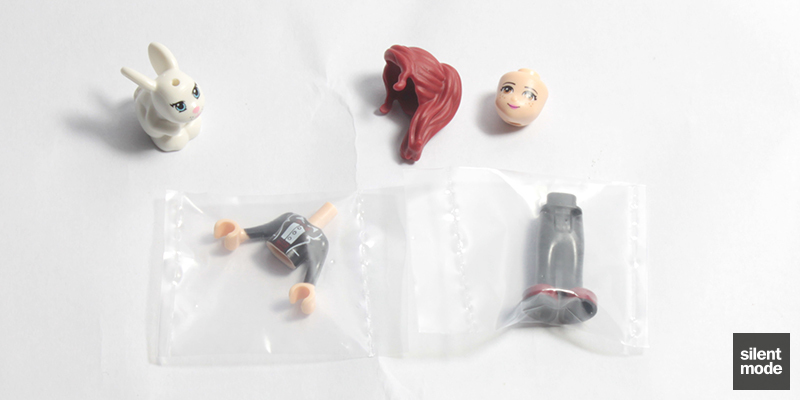 As if we’d expect anything different, the minidoll is provided in four different pieces, with the torso and legs encased in plastic. The bunny has that “Watchu talkin’ bout, Willis?” expression throughout. And here she is, all assembled. First she was an animal enthusiast, then a mad drummer, and possibly even an equestrian; now she’s playing the role of magician. She even has her own show! Is there no end to Mia’s ambition? You’ve probably noticed that this is the first non-girly outfit for a female Friends character, but the purple details make it look a little less masculine. 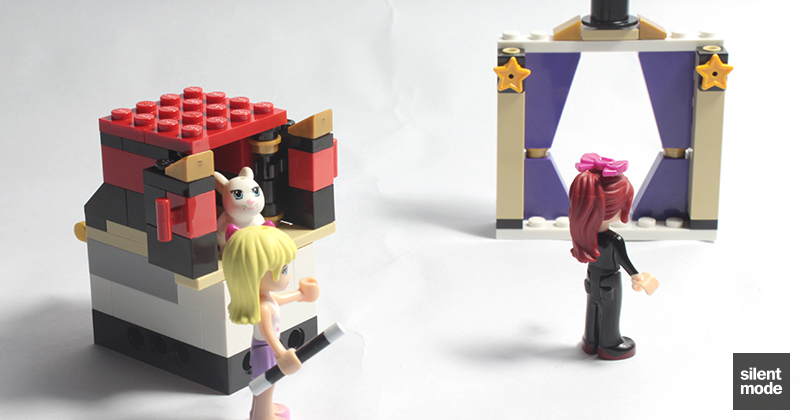 It looks a lot like the same design used for the S1 Magician, just applied to a minidoll’s body. Note that the hands are still flesh-coloured, as opposed to giving her white “gloves”. 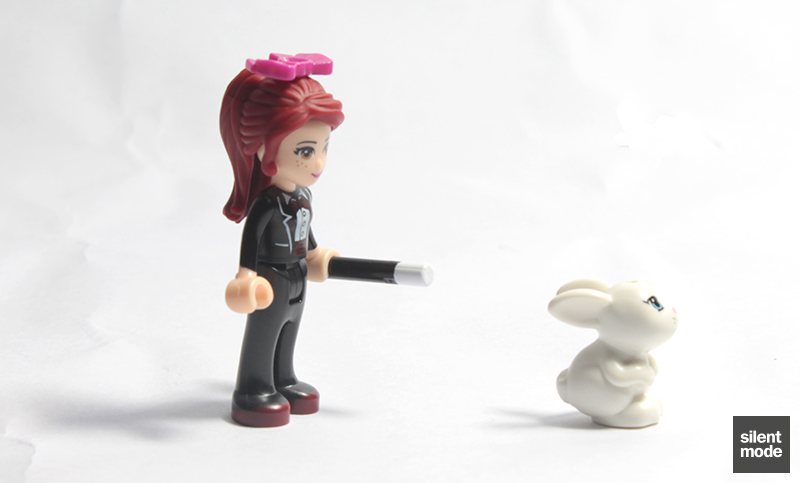 When the bunny doesn’t feel like rehearsing, Mia performs a special trick of her own: discipline with the magic wand. 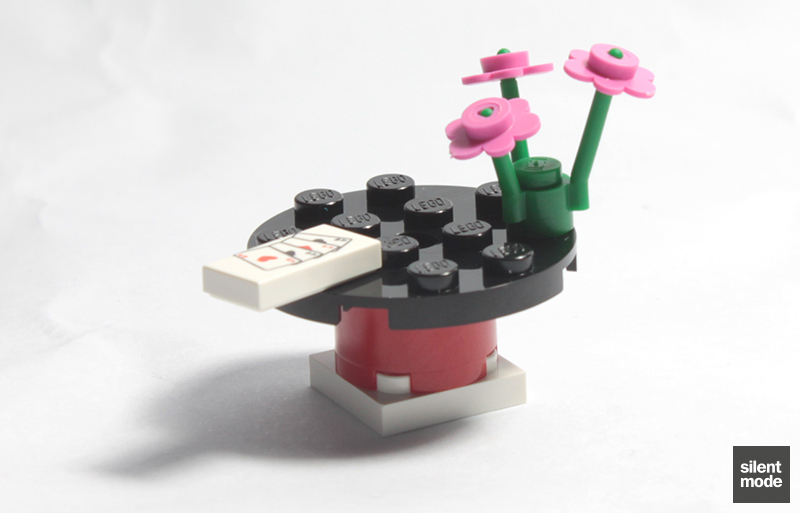 The first thing we get to build, when we get around to building, is a three-piece table for most of the magician’s accessories. At this point only the hand of cards and a set of flowers are placed on it. 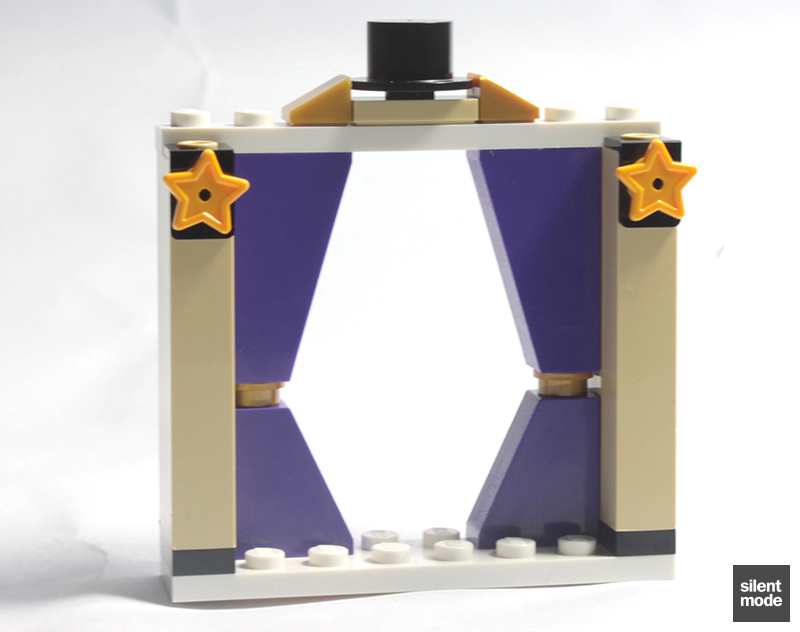 In a throwback to Andrea’s Stage, the next thing we get to build is a stage entrance. The foundation starts us off with two of the Dark Purple slopes, and instead of the cutout slope pieces found in the aforementioned set we’re using more sensible Pearl Gold studs. It’s definitely taking shape over the next couple of steps, and a rectangular entrance has been favoured over an arc this time. You’ll see two of the neck brackets being used on top of the 1x2x5 Tan bricks. 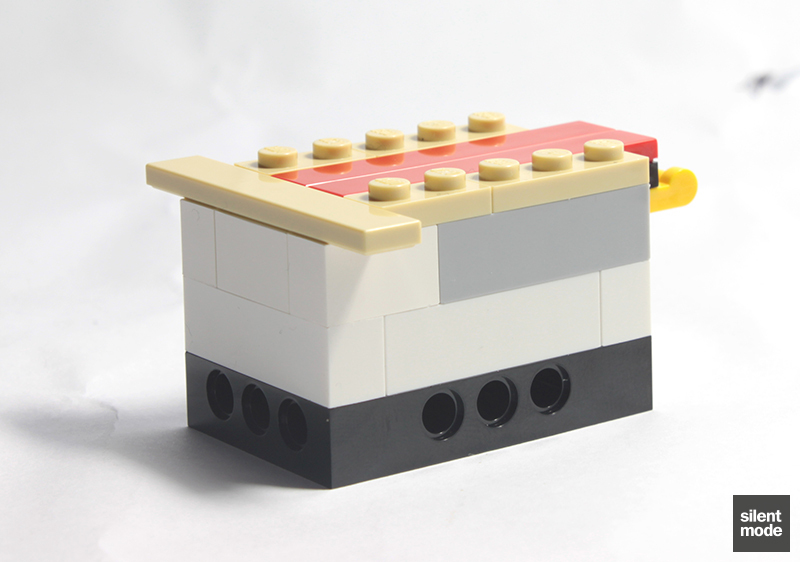 …but then we get to making this “tray” piece on the left, which – when coupled with two “rail” plates – slides inside of those two Light Bluish Grey bricks. 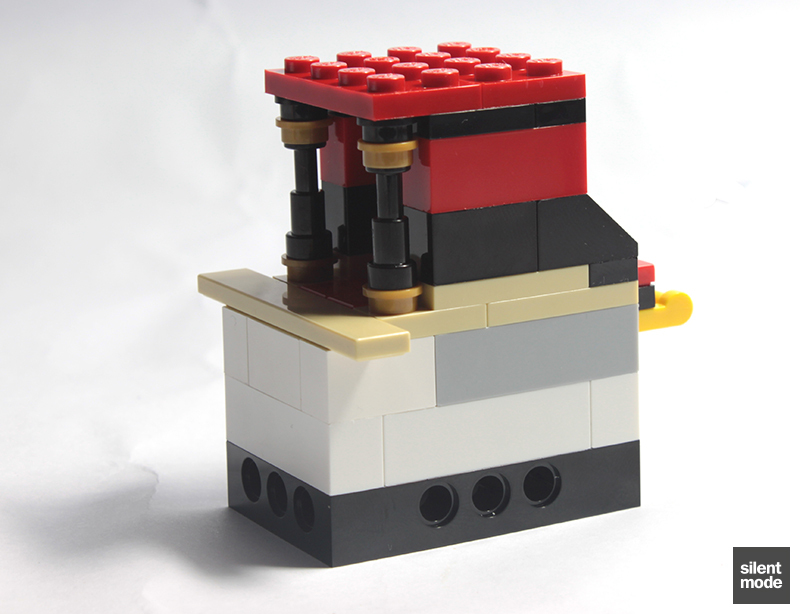 This is another useful technique for anyone new to LEGO, or looking to add interactivity to their MOCs. Note the use of a hinge part to stop the tray sliding out from either end. A few Tan elements are used to cover up the mechanism. You may be wondering why there’s an overhang at the front… so am I. 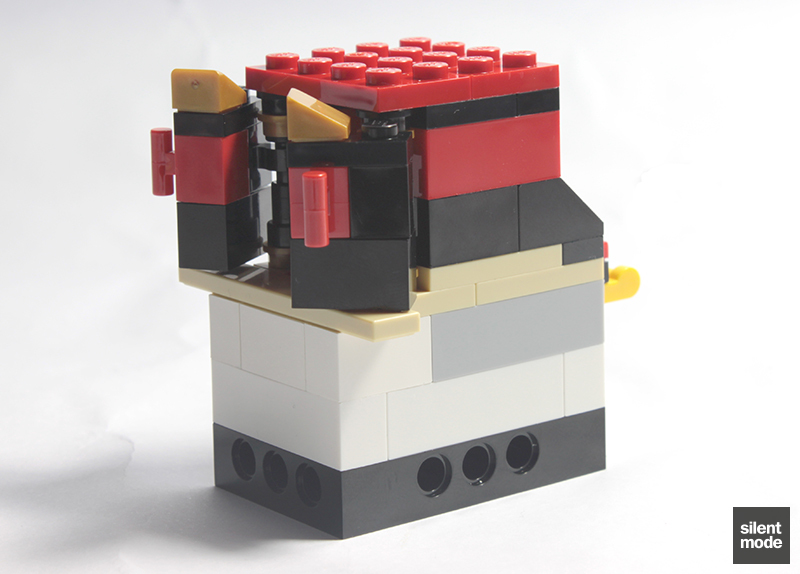 The rest of the cabinet is constructed using Red and Black parts, with two of those telescope parts at the front. The plate at the top is looking a bit wonky, isn’t it? The remaining few pieces are used to make doors for the cabinet; slightly different to each other because they face different directions. They take a little effort to attach to the cabinet, but when opening and closing them we can now see why there’s an overhang with the 1×6 Tan tile. The stage is set for Mia’s big event! (or something cheesy like that) Notice that Mia is wearing one of the bows instead of the top hat, which I’d imagine would make her look more masculine. The set itself is definitely reminiscent of Andrea’s Stage. There’s something for everybody with the leftovers, I think. 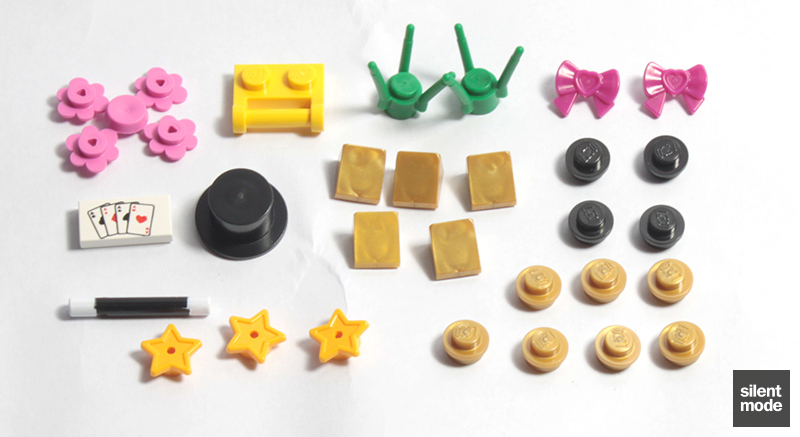 I will be making use of the star plate as well as the minifigure neck bracket; you might like the Magenta bows that were also featured in Cat’s Playground. The back of the instructions doesn’t have anything new. Organising and preparing for the show has proven to be more challenging that Mia thought, so she’s enlisted the help of friend and partner in underwhelming sets Stephanie to act as her assistant. I have to admit, I was pleasantly surprised by this set; what it lacks in the number of exclusive and brightly coloured parts, it makes up for in playability. I found myself spending a short time playing with the cabinet after I was done taking pictures. The main draw for this set has to be Mia in that magician get-up, if for no other reason than it looks unusual, but also for minidoll collection completion. 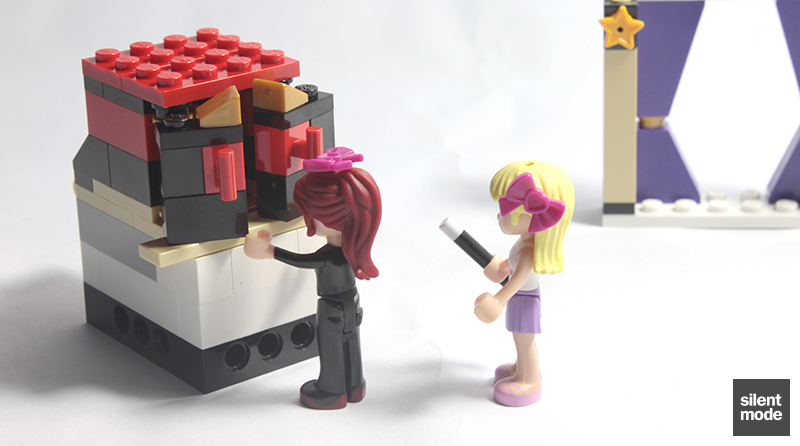 Though it’s probably the least feminine of the female minidoll outfits, it plays to the diversity in each of the minidolls’ interests and hobbies. If anything, the female characters now have a legitimate pair of smart trousers – though I haven’t yet tested how well they go with other clothes. I do feel that the lack of a bag of accessories makes this a more playable set than something like Olivia’s Newborn Foal. Sure there isn’t much interactivity apart from the cabinet, but I did have quite a bit of fun playing with it and it was interesting to see how it was constructed. It was difficult placing the bunny inside it without being impatient and just stuffing it in, but you can make equally sized bits (including Oscar the hedgehog, if you like) disappear as well. 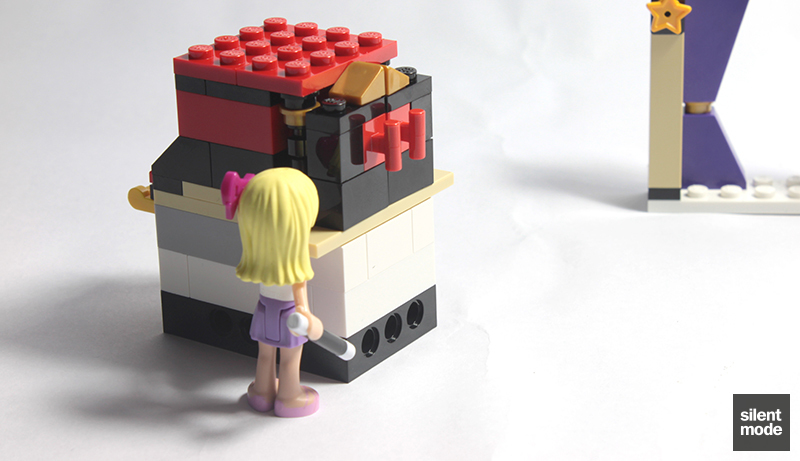 Why not have a go at building a bigger version and making bigger objects disappear? I definitely think that this set is better designed than its equivalent, Andrea’s Stage, in that there’s less colours to deal with and a generally better use of appropriate parts. 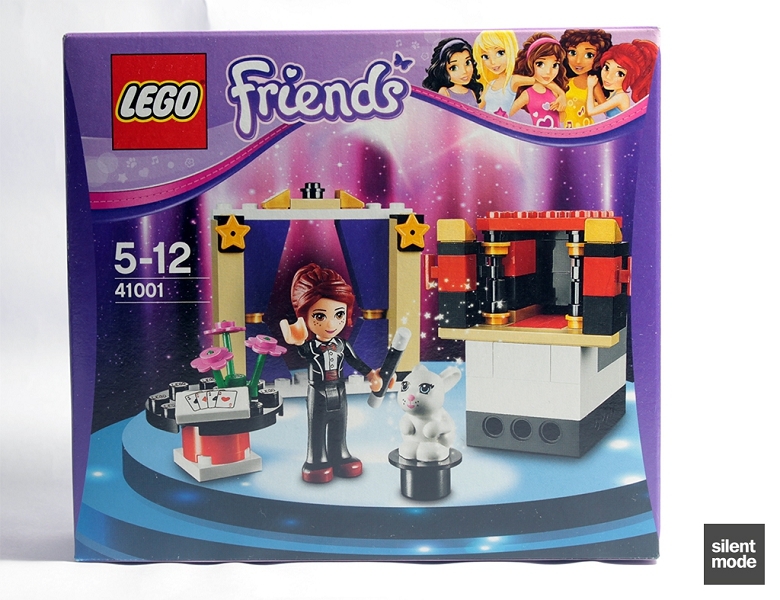 It would have been great to see Magenta used instead of Red to match the details on Mia’s outfit, and to go better with the Dark Purple elements – although from the contents of previous sets this might have pushed the price up, or have resulted in fewer parts. It’s also not obvious as to how to have the bunny sitting so flush on the top hat, as is pictured on the front of the box. I wasn’t able to recreate that shot as the bunny doesn’t quite fit inside or over the hole, and it appears there is something between the bunny and the hat – but I have no idea what. Personally I would like to know. The model as a whole was very well designed for aesthetics and playability, and the small range of colours works in my opinion. 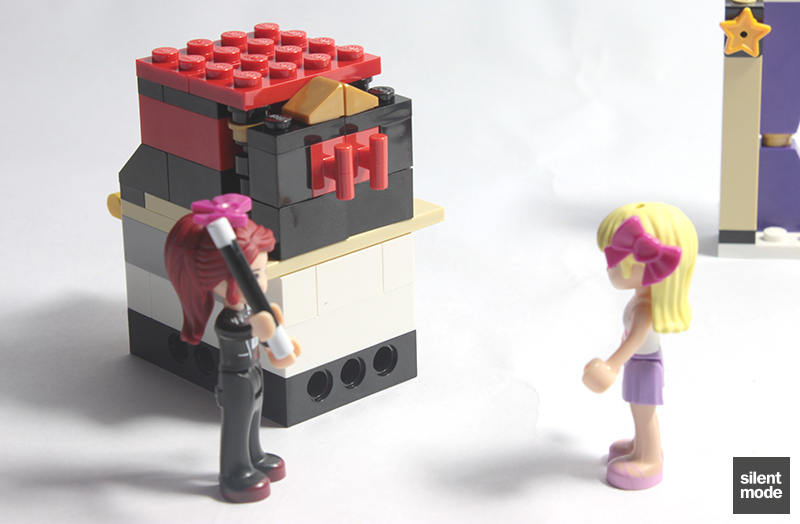 Nothing too challenging with building the set, and there's at least one valuable building technique to be found. 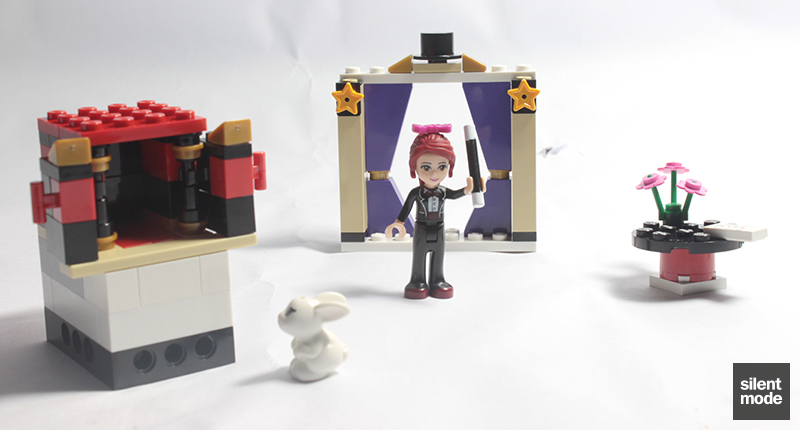 Everything is stable and unlikely to come apart, but that issue with the bunny sitting on the top hat bugs me. Very pleased to see the star-shaped plates and neck brackets, as well as the return of the magic wand. 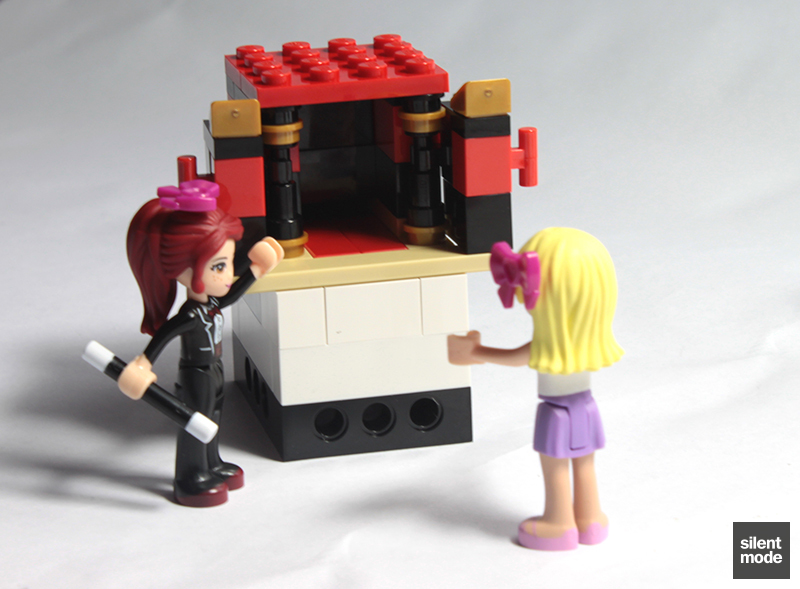 The other parts are just okay; most will purchase this set for the minidoll anyway. Apart from the cabinet that makes things disappear, everything is basically scenery or embellishment. Perhaps add Stephanie from Rehearsal Stage as a magician's assistant. 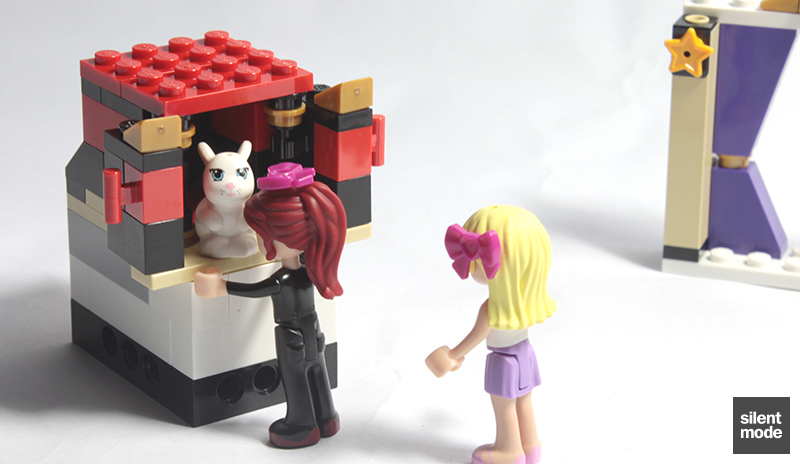 Definitely recommended as a one-time purchase and for minidoll collection completion. For other specific parts it may be better to wait or look elsewhere. Based on these scores, Mia’s magician act gets 7.6/10; and at long last I’m impressed with a set she’s in! But only just. I really hadn’t noticed until after taking the pictures that Mia has trouser pockets on her rear! The legs are the same mould as Katharina’s in Heartlake Stables (second wave), but in Black instead of White. Be warned that Katharina is one of the most expensive minidolls on the black market.